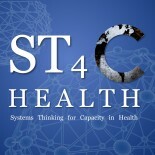 Systems Thinking is a novel, transformational way of thinking about and approaching health. In the past we have witnessed tremendous successes – such as the eradication of small pox and the treatment of diarrhea with oral re-hydration solutions – by considering one aspect of health in isolation, whether it be a specific patient, disease, project, or policy. However, the real world is very complex, and our fragmented approach has too often resulted in unintended consequences such as dependency, inefficiencies, and inequities. Systems Thinking is based on the idea that when all stakeholders and their interactions are considered as a whole, we can better understand health problems than we can when only viewing each part in isolation. Such an approach means that we must consider economic, political, and social factors – factors that might seem unrelated to health. Also, since health challenges are complex, and solutions differ depending on time and place, we cannot impose a top-down plan of action and expect predictable, positive results all the time. From a systems thinking perspective, it is often best to facilitate an environment where local people and communities self-organize to improve health, leading to positive results that health planners might not have even imagined. Systems Thinking provides the principles, approaches, and methods to rethink our basic assumptions about health, and unite to create the future that we want. I have the chance to build national capacities in applying system thinking approach to mainstream HIV/AIDS into national development plans in West Africa over the past years. Systems thinking is common sense for those who see the need for integrated, people centred approaches based on life cycle approaches – you are preaching to the choir here! However the main challenge we all face is resistance from single disease or issues within the Global health Initiative communities who favour targeted technocratic approaches (and are often well funded). The critique of systems thinking is the lack of focus on specific results. Do you contribute to the Universal Health Coverage debates?